i. Prime Minister Modi inaugurated India's first Global Mobility summit 'MOVE' in New Delhi. Comprehensive discussions along 5 themes took place ranging from electrification and alternative fuels and reinventing public transport. The two-day meet of stakeholders has been organised by the NITI Aayog. ii. The summit deliberated on 5 themes, comprehensive: electrification & alternative fuels, reinventing public transport, goods transport & logistics and data analytics and mobility. The main focus of the summit is to make cities of India pollution free. i. Ministry of Railways & Centre for Railway Information Systems (CRIS) organised a seminar on “Leveraging IT for Mobility” in New Delhi. ii. Minister of Railways & Coal, Shri Piyush Goyal graced the occasion as the Chief Guest. Shri Goyal also launched a new app – “AAPOORTI’ mobile App of ‘Indian Railways e-procurement system’ (IREPS). · This App provides information and data related to e-tendering and e-auction related activities of Indian Railways. · For e-tendering activities, users can see details related to tenders published, tenders closed, purchase orders placed. i. The 6th edition of the biennial Bengaluru Space Expo was inaugurated by ISRO Chairman Dr.K Sivan in Bengaluru, Karnataka. The three-day event showcased industry participation in Indian space programme. ii. ISRO Chairman Dr K Sivan addressed that the ISRO wants to offer manufacturing of PSLV and small satellite launch vehicles along with small satellites to private industries. iii. A sum of 10,400 crore rupees is earmarked for manufacturing of PSLV launch vehicle out of which 9000 crore rupees worth production will be given to private industries. i. India is the Partner Country in the 87th Izmir International tradeshow which begins in Turkey. In this tradeshow India will also be launching a mega business pavilion ‘Source India’ hosting 75 Indian companies with the aim of tie-ups in order to increase India’s exports to Turkey and other neighbouring countries. ii. The 87th Izmir International tradeshow will be held in Izmir, the third most populous city in Turkey, after Istanbul and Ankara. · Turkey Capital- Ankara, Currency- Turkish lira, President- Recep Tayyip Erdogan. i. Indian navy ships and aircraft have arrived in Sri Lanka to take part in the joint exercise SLINEX-2018 to be held with Sri Lankan navy at Trincomalee. ii. The exercise which was previously held biannually has been converted to an annual event from this year to enhance cooperation in the maritime domain and to further strengthen mutual trust and interoperability between the two navies. · Sri Lanka Capitals: Colombo, Sri Jayawardenepura Kotte, Currency: Sri Lankan rupee, President: Maithripala Sirisena. i. The government of India has doubled the monetary limit to 20 lakh rupees for filing loan recovery application in the Debt Recovery Tribunals (DRT) by banks and financial institutions. ii. As per the Finance Ministry, the move is aimed at helping reduce pendency of cases in DRTs. There are 39 DRTs in the country. To make the tribunals more effective and to facilitate fast disposal of debt recovery cases, the government has made several amendments in different laws, including the SARFAESI Act. · The Securitisation and Reconstruction of Financial Assets and Enforcement of Securities Interest Act, 2002 (also known as the SARFAESI Act) is an Indian law. · It allows banks and other financial institution to auction residential or commercial properties to recover loans. 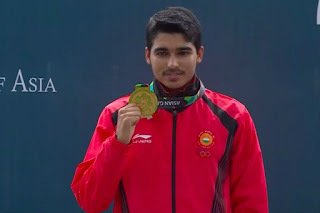 i. India’s Saurabh Chaudhary continued his brilliant run of form as he clinched the 10 metres Air Pistol Junior gold at the International Shooting Sport Federation (ISSF) Shooting World Championship in Changwon, South Korea. ii. The 16-year-old produced an impressive show in the final to clinch the gold with a new junior world record. 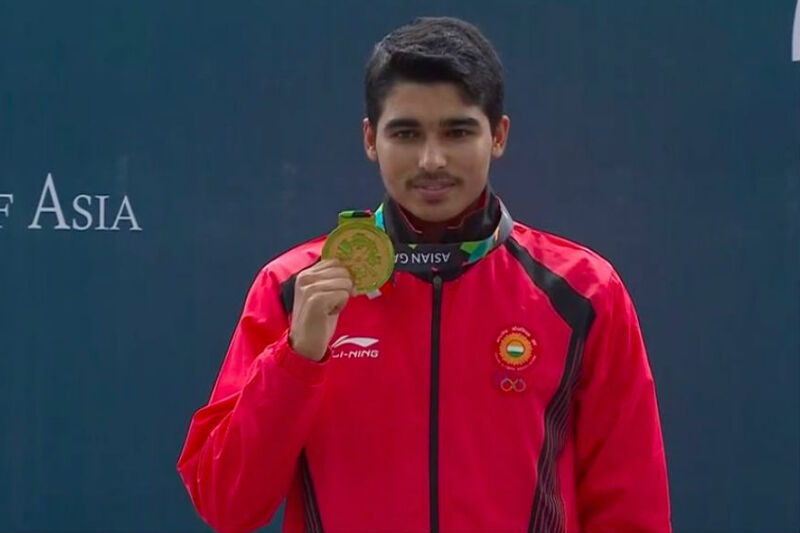 Arjun Singh Cheema claimed bronze in the same event.